Enhancing its clients’ competitiveness, becoming a point of reference in a network of excellence with the scientific and industrial world, transferring know-how and technologies from the automotive sector to other sectors, such as the domotics, energy and medical sectors. These are the areas of application of the innovation to which the Plast-Optic Research Centre (CRP) has dedicated its research and development activities ever since it was founded in 2002. Ten years of activity that were celebrated today in the presence of the President of the Friuli – Venezia Giulia Region, Renzo Tondo, of the Managing Director of the Plast-Optic Research Centre, Paola Carrea, and of the President of Agemont, Roberto Venturini. The Centre was founded in 2002 in Amaro, in the province of Udine, as a result of the collaboration between Magneti Marelli Automotive Lighting, Agemont (Agency for the economic development of the mountain region) and CRF (Fiat Research Centre, which in 2011 transferred its shareholding to Magneti Marelli Automotive Lighting). It is located at the Agemont’s Technological Innovation Centre, a technological hub that features the presence of innovative production companies and research laboratories, capable of encouraging a constant interaction between the system of small and medium-sized companies and the world of Research and of the University. The CRP is therefore strictly connected with the activities of Automotive Lighting – Magneti Marelli’s strategic business line for automotive lighting systems which posted a turnover of approximately € 1.8 billion in 2011 - and specifically with the plant in Tolmezzo (UD, Italy), which represents Automotive Lighting’s global excellence centre with regard to rear lights technology. The Tolmezzo plant alone generates a turnover of about € 160 million, and it employs about 800 people. It supplies a wide range of rear lights to leading global carmakers, exporting about 95% of its production. During this ten-year period, the CRP has operated with the goal of expanding the research activity in order to develop skills to be made available to customers and partners with regards to lighting and LED signalling devices, plastic artefacts and prototypes, technological processes on plastic, optics and electronics and, lastly, new composite materials. 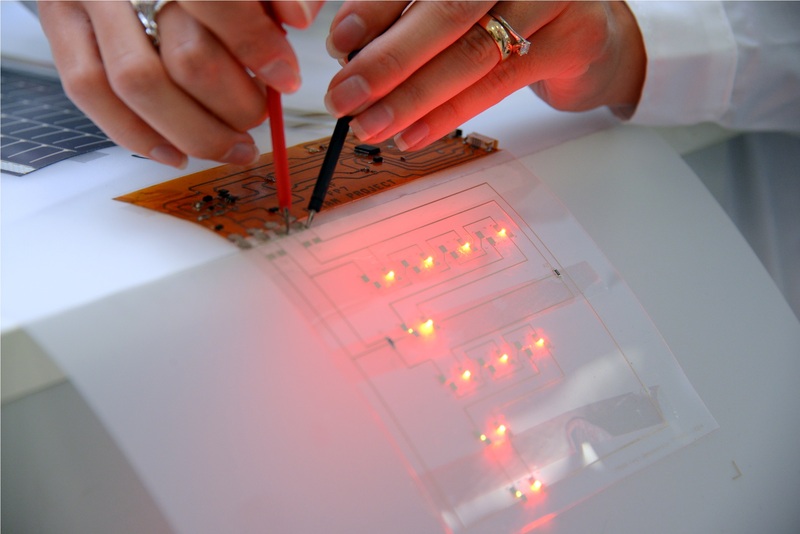 This has led to projects in various sectors, such as the search for innovative lighting systems based on solid-state sources (OLED and chip-LED), the design of new nano-composite thermoplastic materials, the definition of concentration photovoltaic systems and the implementation of innovative injection moulding technologies for the production of micro-structured optical systems. While carrying out its research and development activities, the CRP actively collaborates with Magneti Marelli’s laboratories, offering the possibility to access technological areas which are complementary to those in which Magneti Marelli possesses specific skills. The Centre is equipped with laboratories dedicated to simulation and design, in addition to a LED and Chip-LED assembly line and several presses for injection moulding. Thanks to its network of international partners, the CRP can follow the preparation and presentation of European and national research projects, in collaboration with companies or research institutions interested in the sectors of photonics, nano-technologies and alternative energies, with special focus on issues relating to solar energy. The Plast-Optic Research Centre is a member of the Italian Technological Alliance for solid-state lighting, which brings together industrial and scientific operators in the sector in order to help them become more competitive at the international level. A confirmation of the high level of technological development achieved by the CRP is the Phylla prototype, developed by the Fiat Research Centre together with its partners, on display in Amaro during the 10-year anniversary celebrations of the CRP. Phylla is a multi-ecological city car, sustainable and totally recyclable, with headlamps and rear lights based on LED systems, designed and developed at the CRP, with chip-on-board electronics for high energy efficiency control and long useful life of the luminous sources.